Commemorarative, memorial and pet plaques from Hayne-West. 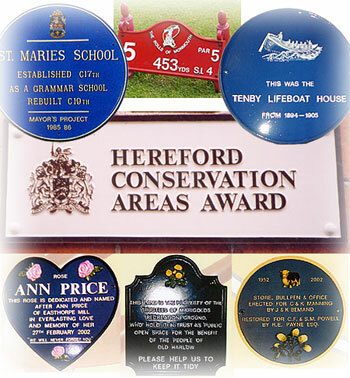 We manufacture special plaques for schools, colleges, historical buildings, government buildings, doctors surgeries, veterinary practices, national parks, golf courses, ‘winners’ plaques for various events, and commemorative plaques to highlight special people, places or structures. Various shapes and sizes are available and logos can be produced as a cost option. Please send us your requirements, or contact us for more details. Your beloved pet’s name and short message can be embossed onto a plaque of your choice for fixing to a wall or fence or inserting by a spike into the ground. A hand-painted emblem can be included, if you wish, such as flowers, cat, dog, rabbit or horse. To mark the door of a stable or kennel with the name of your horse or dog, a range of sign shapes are available in various sizes with a background colour choice of black, white, blue, green, red or brown. An emblem can be included where there is room. We would be very pleased to help you choose the most suitable size plaque to suit your requirements for any of the above. Please send us details of your wording, choice of emblem, shape and colour, together with a clear picture of your pet if you would like us to replicate the colours and markings onto an emblem.